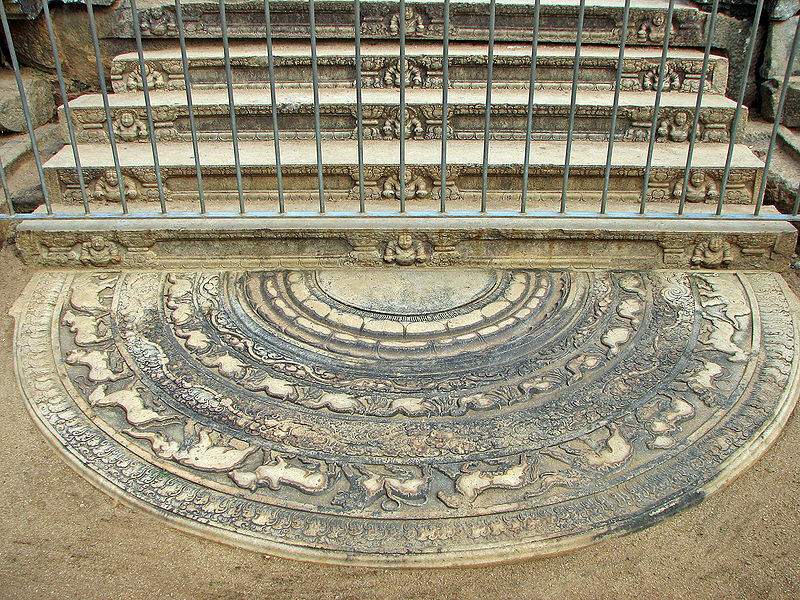 Unique to Sri Lanka, moonstones are placed at the bottom of staircases and temple entrances -kind of like welcome mats – except they are granite slabs and beautifully carved with animal figures and foliage, each representing something significant according to Sinhalese buddhist tradition. 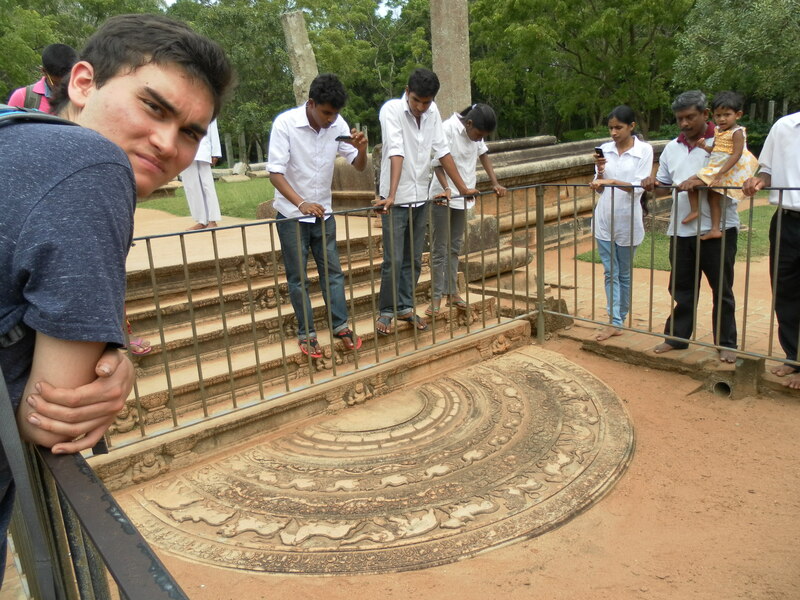 The moonstone above is placed at the entrance of the Seema Malaka temple, a structure that sits on Beira Lake. 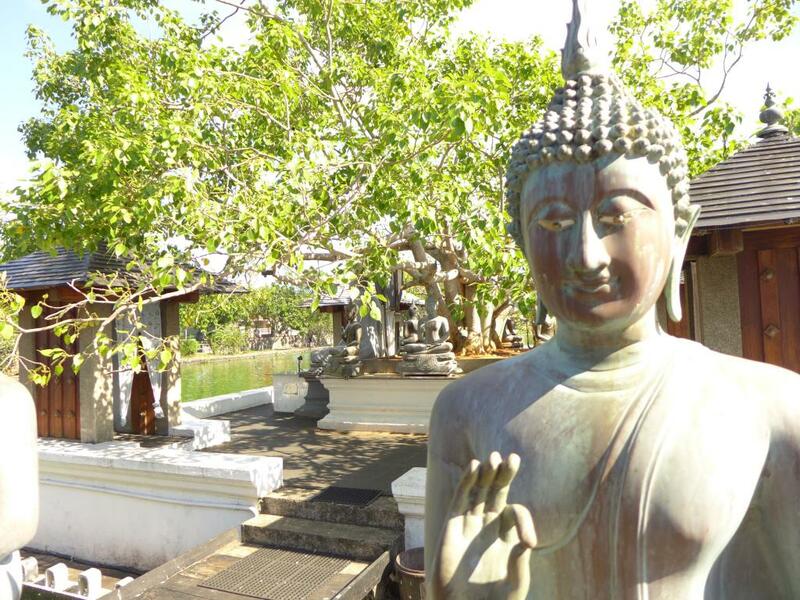 Its a calm little structure in the middle of the excitement of Colombo’s chaos – we headed there after visiting the large, eclectic compound of the Gangaramaya temple. 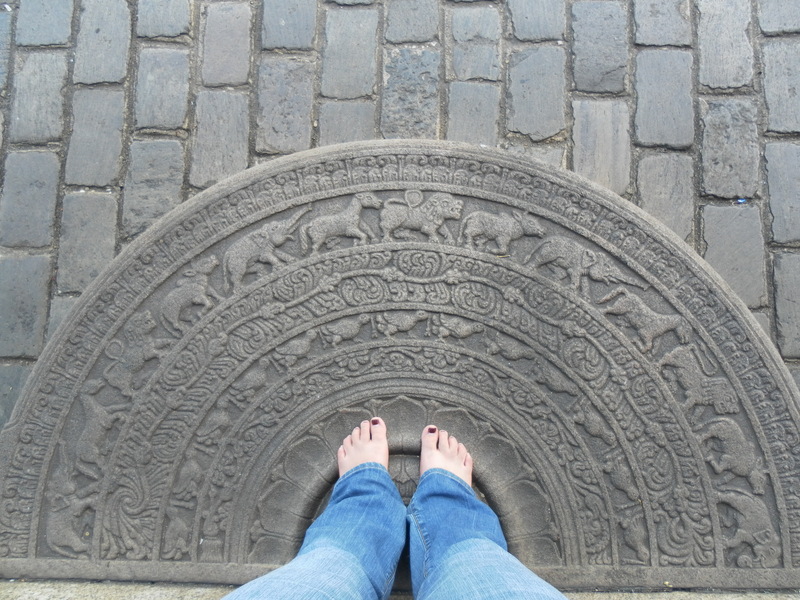 The petals that my heat-swollen toes are standing on are from the lotus flower: a buddhist symbol of compassion and purity of mind. The National Museum in Colombo (totally worth the $2.50 entrance fee) had a brief informational nook on moonstones, explaining the symbolic meaning of the four mammals depicted on one of the concentric bands. They represent the four perils of life: elephant: birth, bull: decay, lion; disease, horse: death. 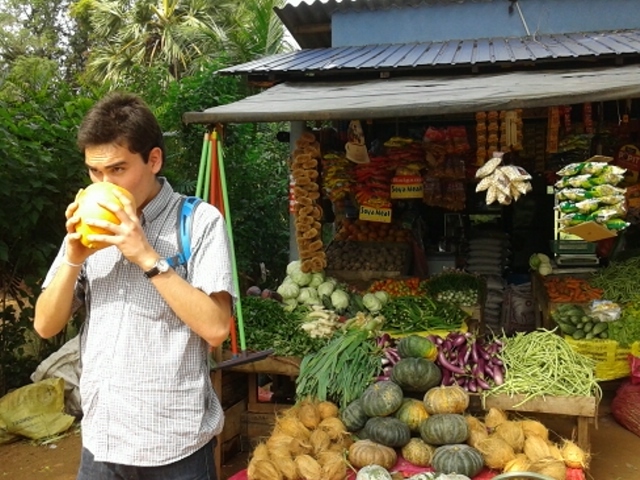 Writing a post on our two weeks on Sri Lanka is a daunting task. I just can’t do justice to what it was like coming from iced-over Amman to step into the landscape bursting with green, to see bodies of water everywhere. The air was so warm and humid my fingers and toes plumped up like the sweet stumpy bananas we snacked on throughout the trip. 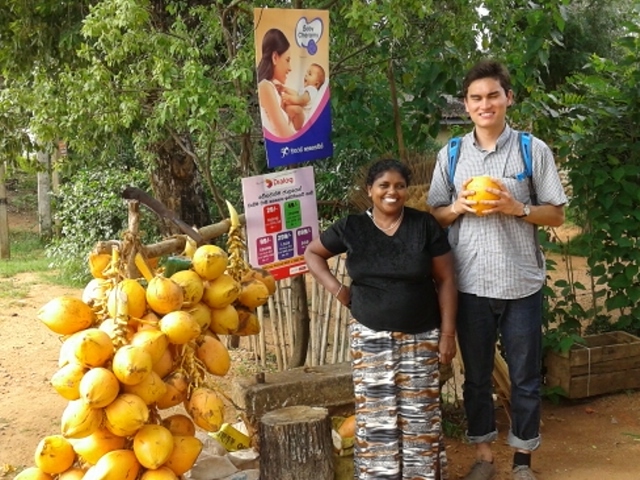 The Sri Lankans we met were so quick to smile, so easy to laugh, and so friendly and open, it took a while to cast the hardened cynicism aside and remember that people can be kind. Mostly, though, it was great because I had my brother and sister with me throughout the entire exploration vacation. After spending a week with Erik in Jordan, we met up with Amy, the third member of our club, at the Kuwait airport before catching our flight to Colombo. We had a four hour layover from Amman, and Kuwait Air kindly provided us with an all-you-can-eat buffet to nourish us/help us kill the time. Of course we were perhaps a little too excited about this “perk” but in any case are now loyal Kuwait Air passengers. 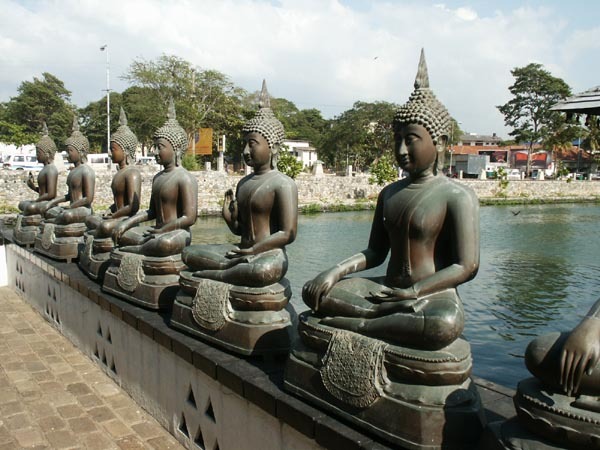 It was a 5 hour red eye flight from Kuwait City to Colombo, the capital of Sri Lanka. 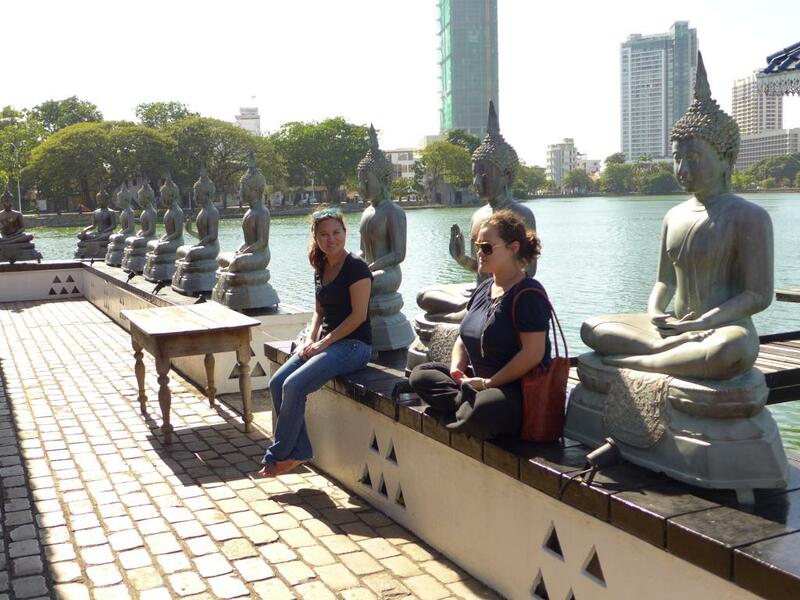 Flights are frequent, although not exactly cheap, between Sri Lanka and the Middle East to serve the many Sri Lankans who work as nannies and domestic workers in the region. My first thought on Sri Lanka was how good the bathrooms at the airport smell: they use jasmine and sandalwood soap that leave just the right amount of lingering fragrance. The visa process was quick and painless enough, as we bought ours online for $30 before arrival, and after walking through a corridor of duty-free goods – big screen TVs, refrigerators, ovens, heating units, all draped in red Christmas tinsel! – we met our airport pickup. We checked in to the clean and friendly Clock Inn, and they let us in to our room 6 hours before official check-in time. We powered through a quick nap before heading out in search of a Sri Lankan breakfast. 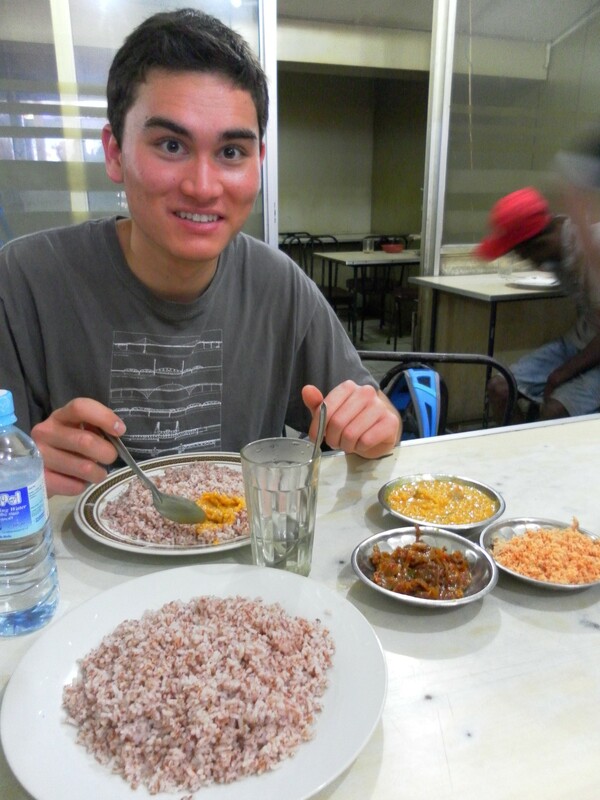 Cheap, spicy breakfast of red rice, potato curry, seeni sambol (sweet, tangy, spicy onion chutney) and pol sambol (shredded coconut with lime and chili). On the road from Jerash to Amman there is a small corner shop that sells tasty local olive oil and olives, cheeses, spice mixtures and sauces – we stopped on our way back from hiking to Pella and I picked up a big bottle of olive oil for $4 and jar of homemade cheese for $3. 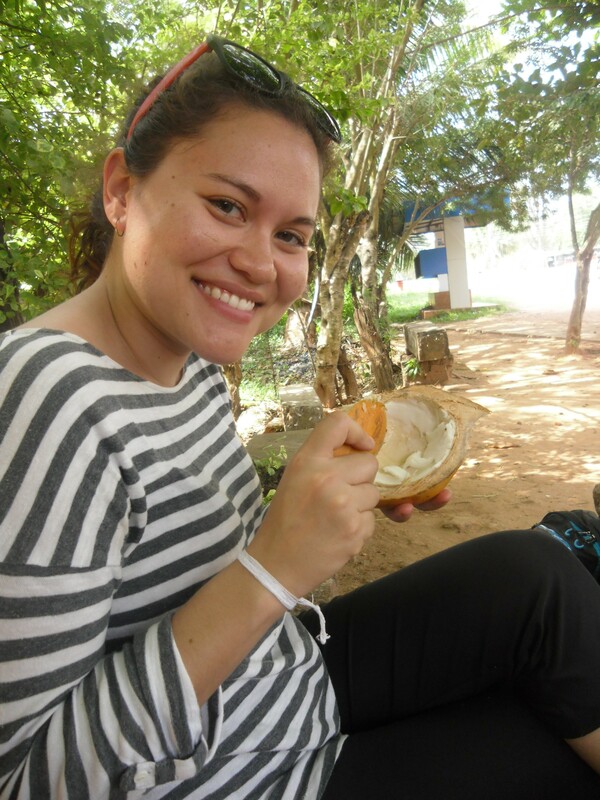 Jordanians go nuts for tangy dairy products and eat just about anything with a side of plain yogurt. The simple labneh cheese is also super popular: the eyeball-sized, spreadable spheres made of salty cow’s milk are eaten for breakfast or as a snack throughout the day. 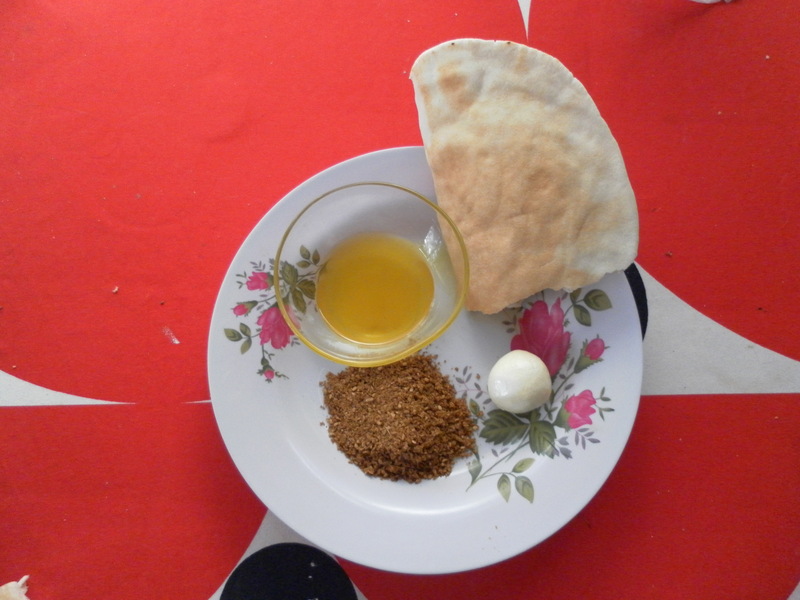 I like my labneh from Jerash with a round of the super cheap flatbread ($0.35 for a little over 2 lbs – thanks to government subsidies), dipped in olive oil from Ajloun and sprinkled with the ubiquitous, versatile za’atar spice mix. My favorite za’atar has sumac added in with the rest of the mix, usually containing toasted seseme seeds, thyme, marjoram, oregano, a bit of salt. Olive oil, bread, labneh, and za’atar: the perfect snack. Snowstorms in the desert. Erik’s travel across the whole of Jordan despite the ice, meter of snow, and scared, dangerous drivers. The McAdams 3 adventure through Sri Lanka. Laura’s first rock climbing experience in the wild. AMENDS conference in Istanbul. Snorkeling the Red Sea with an old college buddy. Getting to know my aunt over hooka and coffee with cardamom. So much has happened since my last post, it is hard to know how to start. I guess I’ll begin with the freshest happening: a hike in the north. 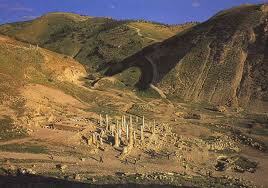 A friend I met through work is, each weekend, walking a leg of the Abraham Path, a long-distance, international trek. 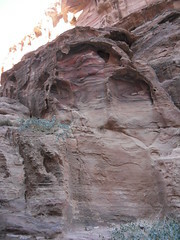 It is more of a symbolic trek; there is no real evidence that Abraham walked in these specific areas. This Friday I decided to tag along with him and his three American friends: some previous Fulbrighters to Jordan, all had studied Arabic in the country at some point and were now working for various NGOs in Amman. A couple of entertaining detours and three hours later, we parked the car in the town’s central square, bought some junk food, and headed out on our walk, tramping through rocky tilled fields and crunchy asphalt paths. 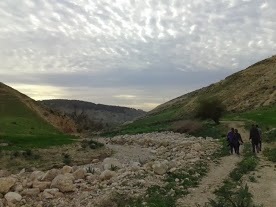 Along the trail we saw something labeled the “Jesus Cave” with an old olive press inside (apparently I did not deem it spectacular enough for a photo) and a field with Jordanian families picnic-ing and enjoying the unseasonably warm weather. 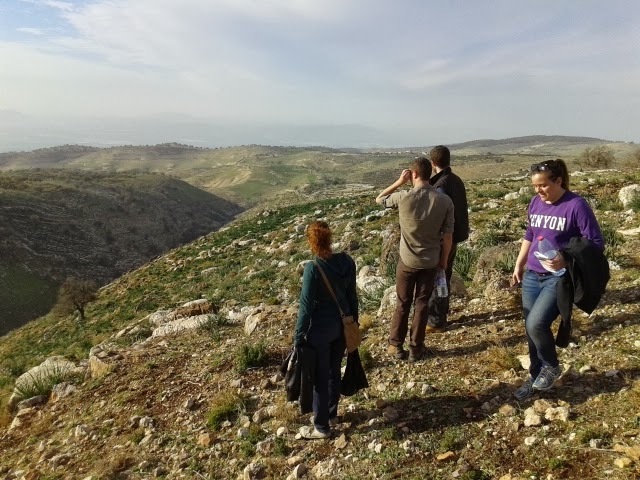 After checking out the ruins of an old Byzantine church (complete with mosaics hidden under the dust that I seriously should have deemed worth of a photo) we began the hike in earnest. 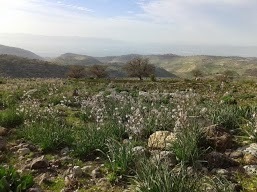 I had heard tales that northern Jordan blooms in the spring, but I never quite believed it until I saw it. We scrambled down the side of the hill into the valley below. I don’t think any one of us managed to get down without taking a tumble or two. 10 kilometers of beautiful, quiet countryside and one cowfarm later, we arrived at Pella just in time for sunset. Photo courtesy of the internet: by now I have Roman-ruin fatigue and just shrugged my shoulders at the site, not bothering to pull out my camera. We caught a ride back to Beit Yedis from Pella for 1JD each in one of those green Hyundai vans that are so common in areas where there is no public transportation, and drove back home for a huge feast of Yemeni food: flat bread as wide in diameter as car tires, a large platter heaped with rice and spiced meats, skillets of mashed tomatoes and stewed broad beans, and a heavy bowl of banana-flavored, creamy oatmeal-like grain, topped with honey. 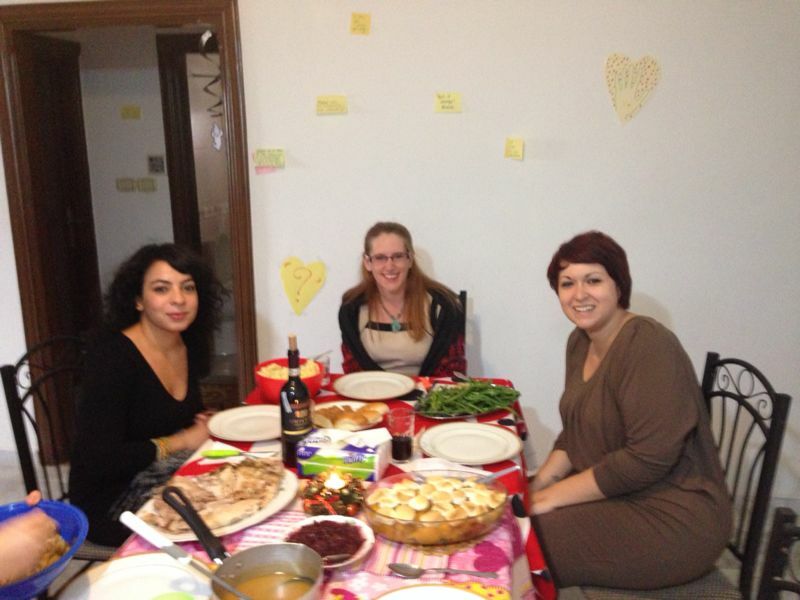 Last week I cooked up my first Thanksgiving dinner for a small international crowd in Amman. 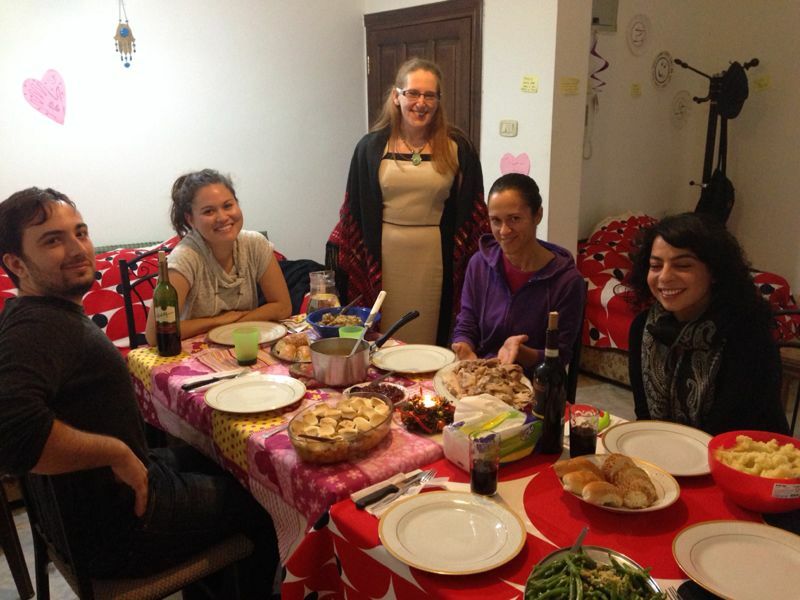 My first Thanksgiving without the other 10 McAdams family members was in 2006 when I studied abroad in Cadiz, Spain. I felt very sorry for myself that Thursday morning as I attended classes, and I still have never felt so far from home as I did then. That afternoon the program director roasted a big turkey and we had a potluck dinner at a restaurant in front of the baroque cathedral. I brought sweet potatoes with multicolored marshmallows: the only type I could find were the novelty shaped spirals. It remains in my (very bad) memory as one of my best spent meals in Spain. In 2010 I was living abroad again, this time in Fez, Morocco. I was part of a close group of expats, one of whom bought a live turkey and kept it on the roof of her house until taking it to the butcher on Thanksgiving morning. That afternoon, I made buttermilk biscuits and green beans with onions at Lillie’s host family’s house. 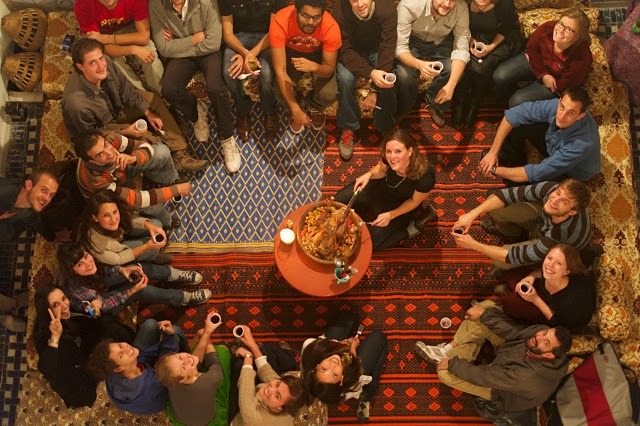 We went to a potluck dinner that night in the old medina, at the house I eventually lived in for 6 months. This year, with no American friends around, I thought I’d let the holiday pass unobserved. I mentioned the upcoming holiday casually to my Italian roommate who promptly got very excited about the prospect of stuffing a turkey “like they do on TV”. So I bought an 8 kilo turkey and made Thanksgiving dinner the way my grandma used to for two Italians, a Jordanian, a Lebanese and a South African. The apartment smelled like home and we all ate too much, true to McAdams tradition. It is settled. 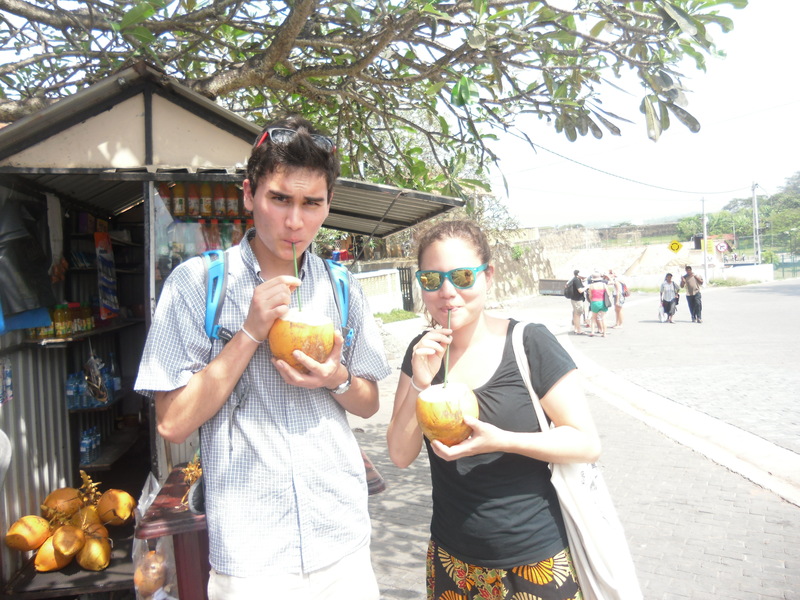 The McAdams siblings will be celebrating Christmas 2013 in Sri Lanka.